Atiba Taylor, Jr. scored 10 of his 25 points in the fourth quarter as Hackensack held off West Orange, 69-66, in the North 1, Group 4 state sectional quarterfinals. HACKENSACK – State tournament, loud gym, tie game, just over one minute to play…it is a scenario begging for somebody to step up and make a lasting postseason memory. For Hackensack, that person was senior BJ Saliba. He did, a three-pointer from the wing with 1:12 left in regulation that finally gave Hackensack the lead for good in a 69-66 victory over 10th-seeded West Orange in the quarterfinals of the North 1, Group 4 state sectional tournament. The win means that the second-seed Comets will host No. 3 Kennedy in the semifinals on Saturday night at 7:00 p.m. and they would also have a home game in the section final should they get past the Knights, a team they lost to in holiday tournament play, as top-seeded Randolph was knocked out of the tournament by No. 9 Bloomfield. Jelani Jackson scored a team-high 20 points for West Orange, the No. 10 seed. Putting themselves in the position of being the highest seed left in the bracket was not easy for the Comets against a West Orange team that only led for a grand total of just 31 seconds in the game and not at all in the second half. The Mountaineers never trailed by more than eight points and never by more than five points in the fourth quarter when it was possession by possession in a highly-charged atmosphere fitting of such a high-level playoff game. 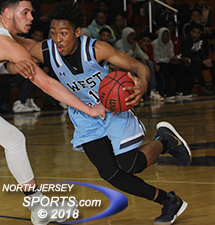 Saliba scored the first five points of the game to get Hackensack off to a good start, but a 5-0 run the other way late in the first quarter gave West Orange one of just two leads it had in the game. Jelani Jackson’s driving layup put the Mountaineers in front for the first time at 16-14 before Saliba put back his own missed shot to tie the game heading into the second quarter, which started Stephon Sheard basket that gave West Orange its final lead of the game, 18-16. Hackensack’s largest lead of the first half was at 29-21 right after Taylor scored on the fastbreak with the help of Toren Portee’s three-quarter court bounce pass that sent him into the open floor and a Saliba three-pointer that just beat the halftime horn gave the Comets a 38-31 lead at the intermission. There was a scary moment in the third quarter when, right after Jackson drew West Orange to within 46-42 with a 2:49 left in the period, Anant Naran planted his feet under the basket to take a charge from Saliba, who was coming in hot. Naran got the call, but also an elbow right between the eyes. Naran stayed down for an extended period and was removed by stretcher and then ambulance as the game was delayed for the better part of 20 minutes. When play resumed after a two-minute warm-up, a Kenyon Sheppard three drew West Orange to within 46-45 and it was still a one-possession game, 50-47, heading into the fourth quarter. Toren Portee finished with 9 points for Hackensack, which will host Kennedy in the semifinals on Saturday night. Hackensack is 21-6 on the season and has been an almost uncatchable front-runner when it can get in front and blow opponents out, but the close ones have not been easy for the Comets to close with the most stinging setback coming against Cresskill in overtime in the Bergen County Jamboree quarterfinals. This game, by all measures, was going to be a close one down the stretch and Hackensack found the answers to the problems it has been trying to solve all season. When Stephon Sheard tied the game at 51, the Comets got back-to-back baskets by Saliba and Portee, who went coast-to-coast for a layup with 6:12 to play. When Jackson’s conventional three-point play got West Orange to within 59-58 with 4:15 to go, Saliba and Taylor scored on consecutive trips to bump the lead back up to five. When Goddy Marc hit a three-pointer and Stephon Sheard hit a floater to tie the game at 63, Saliba answered with the all-important three-pointer that put the Comets in front for good, 66-63, with 1:12 left, but the Comets still had work to do. Kenyon Sheard hit both ends of a one-and-one with 52 seconds left to make it a one-point game and Hackensack then turned the ball over with a lead pass against the press that was a touch too far. 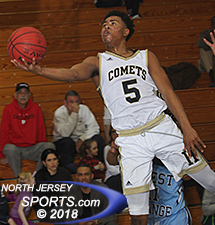 But then Seth Brown, a sophomore who played on the Comets’ freshmen county championship team last season and who was in the starting lineup on Thursday, made a steal of his own that led to a Taylor basket and a 69-64 lead with 40 seconds left and Hackensack held on from there. 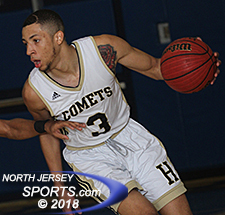 Atiba Taylor, Jr. and Saliba scored 25 points apiece for Hackensack, while Brown (10 points) and Portee (9 points) were the only other two Comets to score. Jackson led West Orange with 20 points and Marc (16 points) and Stephon Sheard (12 points) also finished in double figures. Hackensack is now two home wins away from its first state sectional championship since 2013.